Eight years after the release of their 4th album Walk On, Boston have returned with two new band members (Kimberley Dahme and Fran Cosmo's son Anthony) and a batch of 9 new songs. How will new band members and a prolonged absence affect the sound of Boston? Corporate America opens strong right from the start with the catchy rocker "I Had A Good Time." This has everything you'd expect from Boston: tremendous guitar work, drums leading the way and great vocals. If this single doesn't get airplay near you, harass your local DJ. "You Gave Up On Love" is the definitive spurned lover's power ballad. Odd for a band to spend so long on a studio album but put a live version of a song from their last album on it but this version of "Livin' For You" is a treat. Also interesting is the Kimberley Dahme-penned and sung "With You" which I could see getting good airplay on a country radio station if someone snuck it in the programming. "Didn't Mean To Fall In Love" begins as a beautiful ballad with a lot of promise but the additional big top organ sound makes me cringe. The remaining songs on the album are fair to decent including the overly-dramatic title track and the Oasis-esque "Cryin'." I can't recommend this album unless you are a fan and even then some of the tracks will remind you where the skip button is on your CD player. This isn't because the songs are bad... some are just musically more advanced than the lyrics which come across amateurish. 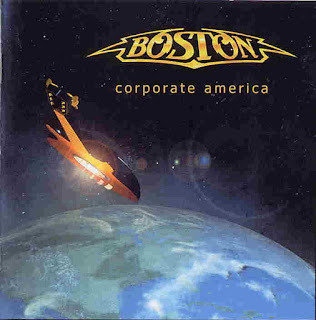 I'm sure part of Corporate America is a Boston album yet for some reason amongst some good songs and classic harmonies are the stuff B-sides are made of.